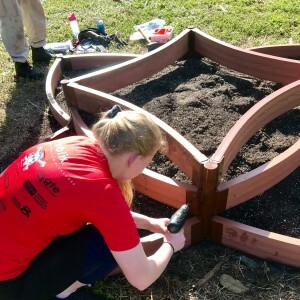 Girl Scout Katherine Poinsett is working on her Gold Award by volunteering to add a Pollination Station to the Children’s Garden at Lakes Park. The Gold Award is open to high school students, and it’s the highest award achievable in the Girl Scouts. It is a 7-step project that challenges Scouts to identify a community problem and solve it. Team Katherine, transforming one of the Lakes Park Children’s Garden “star beds” into a Pollination Station. 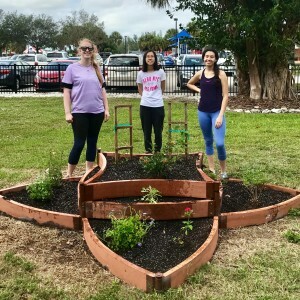 Katherine designed this project to support the local pollinator population and educate the public about their role in agriculture. Pollinators such as bees and butterflies help to ensure the production of one-third of the world’s food. Her project demonstrates how gardeners can “plant for pollinators”. Coincidentally, the Foundation’s Children’s Garden Committee discussed a Pollination Station after construction of the ABC Garden. They deemed Katherine’s project a great fit. Mentoring and guidance were provided by Committee Chair Wendi Carroll, Parks & Rec Deputy Directory Alise Flanjack, and Botanic Garden leader Kathy Busick, to name just a few. Babu Mathew helped with plant recommendations for the Pollination Station beds. Katherine is a senior at Estero High School this year, and she is a member of Troop 245. She was required to assemble a team of advisors and support, and submit her project proposal to the Girl Scouts of Gulfcoast Florida Council. Katherine’s project aligns most closely with the “Outdoors” national program pillar, as defined by the Girl Scouts organization. This pillar focuses on environmental stewardship. 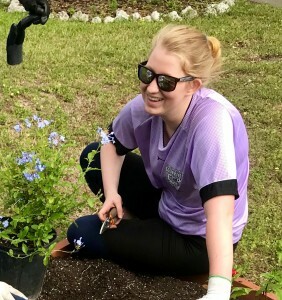 As Katherine continues to work on her project, the Foundation looks forward celebrating her efforts and publicizing the educational opportunity her Pollination Station offers. Stay tuned! 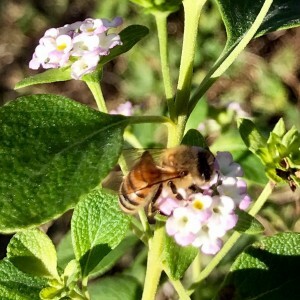 A new visitor to the garden – the news of Katherine’s Pollination Station has traveled fast! YOUTH VOLUNTEERS ARE ALWAYS WELCOME! The Foundation is happy to work with Scouts, 4-H members, and other youth volunteers, and help them to help the park and achieve their goals.